The other day, I got my teacher data report. Last year I didn't see mine. (My former principal was a bit of an odd duck about things like that.) This year, I imagine that Principal X will expect me to have seen mine at some point, so I figured I ought to familiarize myself with it. For whatever reason, I braced myself for the worst. Now, here's the silliness of these reports. I know I'm not, actually, this awesome teacher. On a good day, I'm probably pretty good. On a bad day, uh, it might not be so bad to let the kids teach themselves, know what I mean? I'm still newish. I'm still learning. I'm not the best I'm ever going to be. I know in my building that there are a LOT of teachers who are holistically better teachers than me. 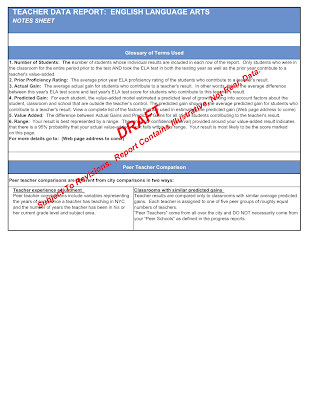 At best, these reports should be one part of any evaluation of any teacher--and we should remember that most teachers will actually never see a data report, too, because they don't teach testing grades or subjects. So there's that, too. These things are a Catch-22 for the nonreflective teacher or administrator. I mean, if I were that sort of person, I could sit back for a while now and say, Well, I'm already AWESOME, so I don't have to do anything to learn more or improve my practice. Nope! I'm ALL DONE. This is, obviously, not true. As well, on the converse, an administrator might only look at the numbers and not look at what a teacher has done since those numbers (as, don't forget, these numbers are now 14 months old) to improve his or her practice. The data are a piece of the puzzle, maybe. Maybe. They're not the whole picture. Anyone want to tell this guy that he's only a mediocre teacher? I'm sure no one would want to say that to him. I bet he's busting his hump to make school great for his kids. And in my book, that counts for an awful lot more than a few numbers on a data report that probably wasn't even produced by a human being. So I'm not going to phone it in for the rest of the year or anything. Though it will be fun to sit through yet another lunchtime faculty conference about "data-driven instruction" and chuckle on the inside, thinking that, if all instruction were merely "data-driven," I'd be chilling in my classroom with my sandwich, in the dark, alone, not listening to more claptrap about data. Of course, as a reflective teacher, I know that being a good teacher is about a lot more than a number on a data report. But does your administrator know that? Does Joel Klein?